I recently wrote about some of the best castles near London and got some great feedback on that post. 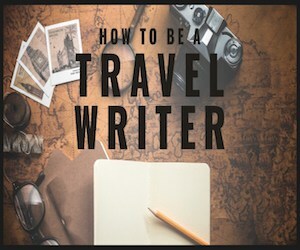 So when we recently visited Scotland I figured it would be a great time to do a similar post but with castles near Edinburgh to visit! Some of these we’ve visited many times over the years and actually at least one was really new to me. 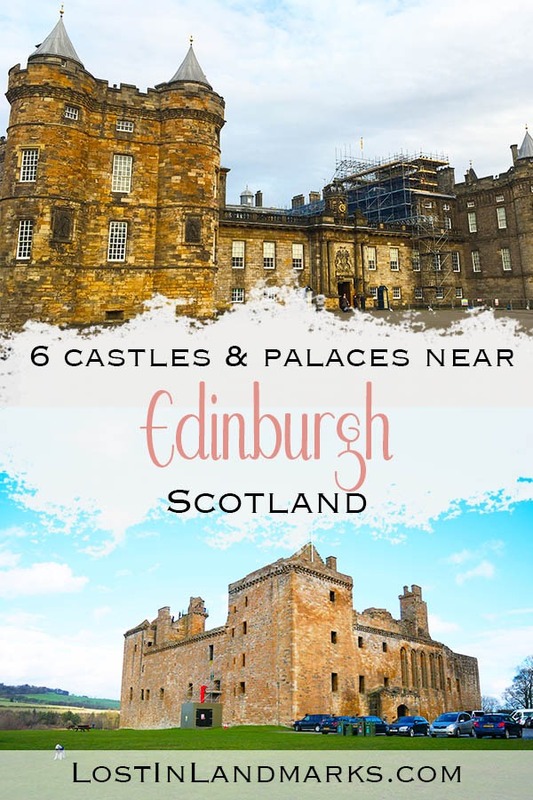 I hope you enjoy this guide to the castles in and around Edinburgh and find it helpful when planning your Scotland trip! 1 What are the best castles near Edinburgh to visit? 2 A tip for saving money when visiting these castles! What are the best castles near Edinburgh to visit? A tip for saving money when visiting these castles! All of these castles and palaces with the exception of Holyrood House are part of Historic Scotland and as such can be visited using their passes. If you live in the UK you might find a yearly pass worthwhile, but if you’re just over on a short trip then I can recommend the Historic Scotland Explorer pass. We used it this past trip when we visited the abbeys in the Borders and it made it so easy and there are so many places you can visit! If you’re visiting Scotland and the capital Edinburgh and also have an interest in castles then you’ll be mad to miss the most obvious one in the centre of Edinburgh itself. Edinburgh castle looms over the city and is a landmark that begs to be visited. There has been evidence of human activity on the castle rock going back thousands of years but of course the main bit of history most are bothered about is the castle as it stands now. It was the site of a royal castle from the time of David I in the 12th century up until around the 15th century when it began to be used more as a military base. The actual building is complex with one part dating as far back as the 12th century which is St Margarets Chapel. Among so many things, you can see the Honours of Scotland also known as the crown jewels, the stone of destiny – where kings of Scotland were crowned and also Mons Meg – a 15th century gun. If you’re around at 1pm (except Sundays) you’ll also be able to see and hear the one o’clock gun be fired – a tradition that has been going on since 1861! It used to be done to allow ships to set their maritime clocks. Edinburgh Castle is situated at the top of the Royal Mile in the centre of the city itself. You really can’t miss it! Edinburgh is a really walkable city but if you feel like you want to take some stress off your feet a hop on hop off tour bus may be a good idea which will allow you to see lots more in a day. This one is great value as it includes entrance to both Edinburgh Castle and the Palace of Holyroodhouse among some others. If you’re travelling by car then I recommend getting the Park and Ride from the outskirts of the city and taking the bus in to the city centre. You can buy tickets on the day from the booth in front of the castle. Purchasing tickets in advance is a great way to beat any queues on the day and it can get quite busy. You can buy them online here and do remember that if you’re planning on visiting many more castles on your Scotland trip that an explorer pass might be worth considering too. The Palace of Holyroodhouse is an official residence of the Royal family when they are in Scotland and as such is a working palace. In all of my trips to Edinburgh it’s one that I’d never been to, until this most recent time. I had a sole trip and not having to take the kids around meant a very pleasant afternoon for me. I do love the history of the Royal Family and it was such an interesting place to visit. An abbey was built on the site when a vision of a stag was sighted in the area back in the early 12th century. It had a cross between it’s antlers and as such the name of the site became HolyRood or Holy Cross. It became a royal palace in the 15th century when James IV stayed there and decided to convert the royal lodgings in to a palace. 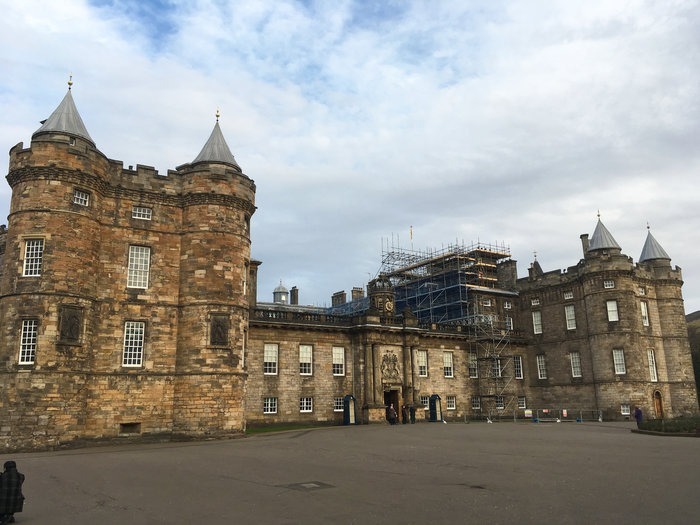 Some of the palace is much older than other parts – the oldest being the left wing (with the turrets as you see in the picture) that dates back to James IV and has lots of history from the Mary Queen of Scots era. It takes a couple of hours to go round the palace – you go round with a self guided audio tour which tells you all you need to know about all the rooms in the palace. It feels like a quite homely place, not as huge as I’d imagine Buckingham Palace might feel! It’s amazing walking around and imagining all the previous Kings and Queens being in the rooms. I went in winter and late in the day and it still had quite a few people visiting so it would definitely be much busier in the summer months – you can take your time as you go round though which helps. Entrance to the Abbey is included as is the audio tour in different languages, plus a kids version. The Palace of Holyroodhouse in at the opposite end of the Royal Mile to Edinburgh castle. 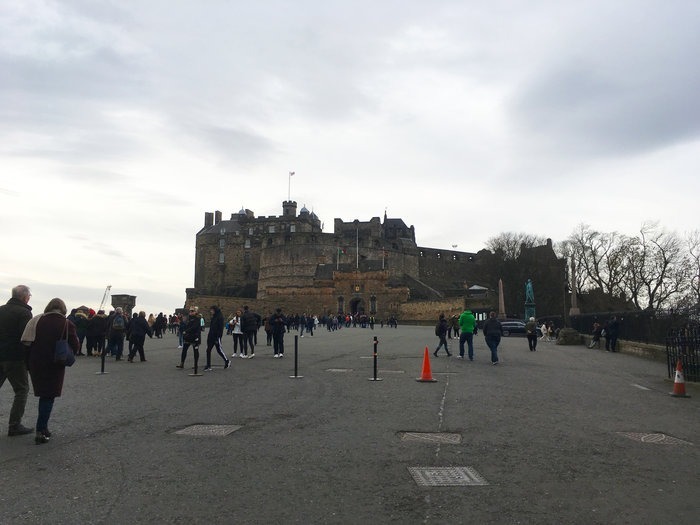 It takes around 10 – 15 mins to walk between them although as mentioned in the above Edinburgh castle section, a hop on hop off bus ticket might save you some time and your legs – this one even includes admission to the palace! Tickets are available from the palace itself. It wasn’t busy when I arrived in winter and in the afternoon but if you’re on a tight schedule and want to skip the queue then buying online would definitely be worthwhile and isn’t any more expensive. You can get tickets here. Linlithgow palace is in ruin now, but in its heyday was a residence for Scotland’s monarchy in the 15th and 16th centuries. 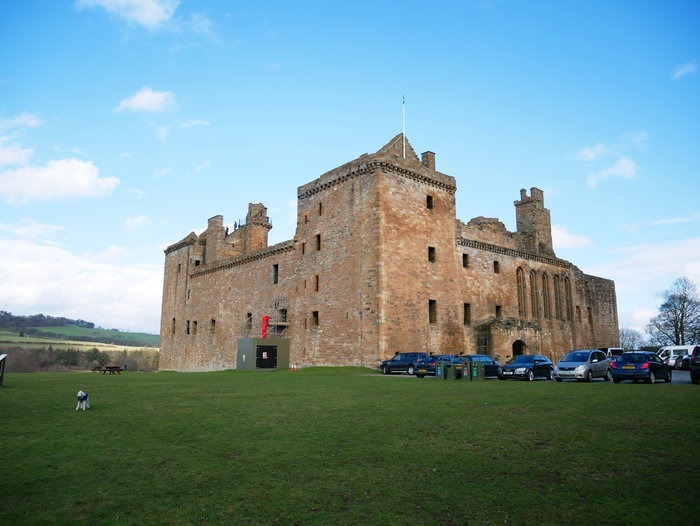 As with many castles in Scotland the links to Mary Queen of Scots is highlighted and this one has a big link – she was said to have been born there. It’s an interesting building which shows signs of the era it was built with a very imposing fortress looking outside – very different to some romantic ideas of castles and palaces. The inside is in ruins but there’s much to see with a fountain, huge old kitchen fireplaces, the great hall and some amazing views from the top. You’ll probably want only an hour or so on your visit but we really enjoyed our time there. You can learn all about the time of the palace through lots of information boards all round and it’s situated in a lovely area just by the water that’s perfect for a picnic if you visit on a nice day! It’s also dog friendly to visit – bonus points if you can spot our little white dog in the pic above! You can get an explorer pass which includes entrance to Linlithgow Palace or you can pay easily on the day and it’s not often too busy there. Linlithgow is around 20 miles West of Edinburgh and is easily reached by car – there’s parking at the palace for people visiting inside. 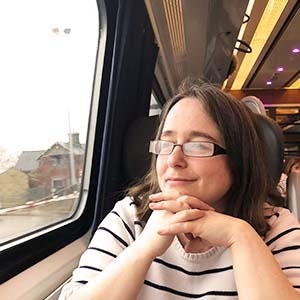 It’s also easy to get to Linlithgow using public transport – a train leaves approximately every 20 minutes from Edinburgh Waverley (heading to Glasgow) and the journey time is about 20 mins. See the Trainline for more information on train tickets. 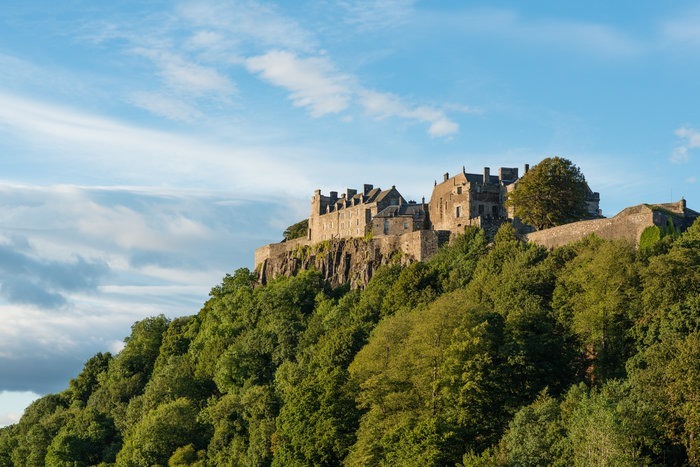 Stirling castle is a definite contender to the most spectacular castle and it looks really amazing perched on the rocky outcrop, not unlike Edinburgh castle itself. If you’re driving around Scotland and past Stirling you’ll get a great view of the castle as you drive on by but if you can, go for a visit inside – it’s much quieter than Edinburgh Castle. It’s unkown the exact age of the castle but it dates from around the early 12th century which makes it one of the oldest out of the ones on this page. It’s seen so much history too with the wars of independence seeing it switch sides, sometimes being used by the Scots and sometimes being taken over by Edward I, the English king. There’s lots to see and do in the castle itself with exhibitions, beautiful rooms to see and kids activities too. It’s been a while since I have been to Stirling castle myself, at least 10 years I think – I’ll have to go back and discover it all over again! If you want to buy tickets in advance, and I recommend this especially in the busy season, then you can get them here. Stirling is a city in the centre of Scotland and well worth a day trip if you’re visiting the country and want to explore further afield than just Edinburgh. It’s about an hours drive west in the car from Edinburgh. Trains take around 50 mins from Edinburgh Waverley and are the best option if you’re looking for public transport. Alternatively, Stirling Castle is often part of private tours that run like this one that takes in Loch Lomond and the countryside as well.. Sometimes it’s called Edinburgh’s other castle and I’ll admit that this one was a new one for me! I’ll also have to confess to a mishap on the day where I managed to leave my bag, money and tickets all at home and didn’t realise until we got there! We had to make do with a wander around the outside – we’ll have to try again another time to have a look inside. Craigmillar castle is a really good example of a medieval Scottish castle and it was built in the 14th century. One of the more interesting pieces of history from this castle is again linked to Mary Queen of Scots (are you surprised??) – she came to the castle to get better after being ill when having her son, James VI. Apparently before she left the castle a pact was made to get rid of her husband Henry Stuart – whether she knew about it or not is not known. This was called the Craigmillar bond and he was subsequently killed in the next year. The castle is in ruins now but as always you can see and get a good idea of how life was like in the time, especially with the information boards that Historic Scotland put up. This is so close to the centre of Edinburgh that it’s a really nice one to have a trip to that gets you a little away from the city itself – you also get some stunning views there of the coastline and of the city. Tickets can be bought in the castle itself or it’s included in an Explorer Pass. It’s also a dog friendly castle! 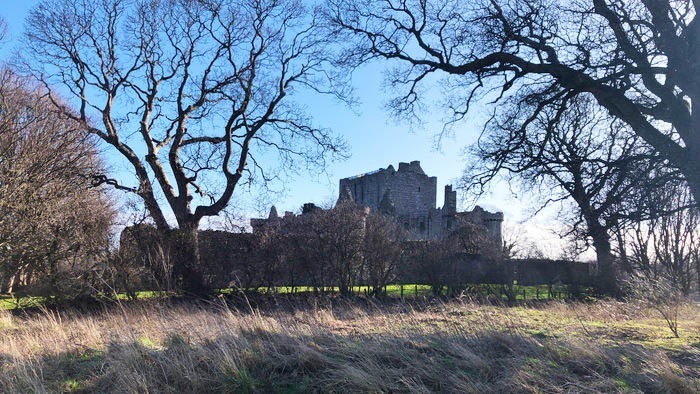 Craigmillar Castle is around 3 or 4 miles south of the city centre so not far at all. If you’re driving you’ll find parking at the castle for those visiting and there’s some nice walks around the castle too which are worth spending some time on. If you’re in the city and want to get a bus, they take around 25 minutes with a ten minute walk on the other side to get to the castle – be aware of this if you have mobility issues. Leaving from the North Bridge (outside waverley train station) the numbers you’ll want are either 8,14, 30, 33 or 39. Each bus stops at a slightly different place so ask on the bus if you need help with where to get off. This is a good site to check public transport options. Being so close to the city a taxi would also be an option if you don’t have your own transport. Over the Firth of Forth into the Kingdom of Fife is a really nice and interesting castle on an island on Loch Leven. 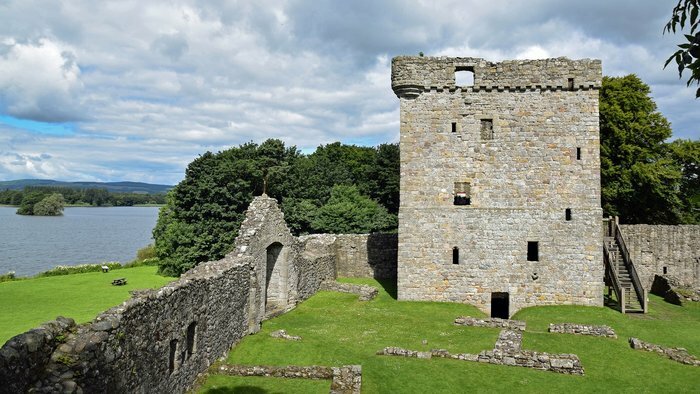 Loch Leven castle has an interesting history, including being the place where Mary Queen of Scots was kept imprisoned, forced to abdicate and subsequently escaped from. Yup – more Mary Queen of Scots history! Actually when I was younger I read a book which had the story of this in it – it was called Escape from Loch Leven, so for me it was really exciting to get there eventually! The castle is a ruin and there’s not a lot to see and do there, but if you hit it on a nice day you’ll have a wonderful time exploring it as it’s so peaceful. You reach the castle by boat which is included in the entry price (again this is included in an explorer pass) which makes it a nice day out and a slightly different trip, especially if like us you’re taking people with you who don’t always love the history of the place! My kids were normally fairly happy with our trips but being able to make the slightly different was always a plus. Due to the fact that it’s reached by boat, make sure you’re not in a huge hurry to get off it – when we went we had to wait for a group of people ahead of us to leave before us. We didn’t mind so much, but if you’re in a hurry or have people who get bored easily its something to bear in mind. It’s also a good idea to book your tickets in advance for this one too before you set off as it would be a shame to go all that way and find the boat schedule is full – you can book online here. We didn’t when we went but that was slightly out of season. Also be aware that the castle is closed in the winter season: 1 November – 31st March. By car it’s around 28 miles away and takes just over 45 minutes to get there. Parking is available. Bus is probably the best way to get to the castle by public transport from Edinburgh. The X56 to Perth can drop you at Bridgend and it’s a short walk from there to the Ferry office.